Purpose: For professionals new to fundraising or in a new position who desire a mentor for guidance, encouragement, and support. 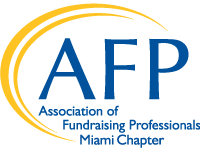 The AFP-Miami Mentor program will provide professionals new to fundraising (or interested in professional growth) with mentoring opportunities from master practitioners (7+ years' experience). Please click the links below to learn more and join the AFP Miami mentor community.